Glasgow is full of hidden delights. The Style Mile and shopping centres might steal all the attention with their designer shops but have no doubt – Glasgow has some of the best independent shops around. With everything from vintage fashion through to old book stores, there is an independent shop in the city for everyone. Check out this list of the best independent shops Glasgow has to offer and get visiting them now. Factory 45 is an artistic hub that is dedicated to Glasgow’s movers and shakers. Run by a non-profit organisation it is a retail space that allows the up and coming talents in fashion, art & design to showcase their artistic products. They also have a number of vintage items available in the store. This Merchant City space is perfect for those of us that like something a little bit different. You can find just about anything down at the Barras. This market blends old and new with the Glasgow’s up and coming music scene. 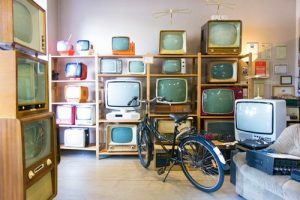 From carpets right through to old VHS tapes – there is an interesting find every time you visit. Glasgow has an abundance of vintage fashion stores. You can find them dotted about the entire city. One of the best of these is Mr Ben. Situated at the bottom of the city centre you can find weird and wonderful pieces of clothing here. From old military uniforms to 60s fashion. You’ll be sure to find something for you. If beer and wine is your thing then Valhalla’s goat is the perfect shop for you. From local breweries to international beers there is a selection to satisfy everyone’s taste buds in this off licence. With a large selection of wines and chocolates as well, there is no way you’re leaving this store dissatisfied. This really is quite the experience. You can grab an exquisite cup of coffee, buy some presents, do homeware shopping and post any letters in this independent shops Glasgow. You’ll spend more time than you intend to in Penny Black. Take a trip down to Shawlands if you want to get your fix of both hardback and paperback books. Young’s can be described as a bookworms dream store. Titles are loosely stacked according to genre and avoid that uniform look that chain stores offer. There is such a variation of books that you won’t know what to read first. If records are your thing then Monorail is the place for you. 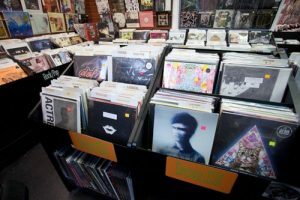 With a massive range of one off Vinyl’s alongside easier to find retro ones, you’ll definitely find something you like. If you are lucky then you’ll be browsing alongside Glasgow music royalty as several artists like to make the visit.